France in London | Could Strauss-Khan be the next socialist candidate for the 2012 presidential election? Could Strauss-Khan be the next socialist candidate for the 2012 presidential election? It seems to be in fact one of the France's wishes. According to a poll published in "Le journal du dimanche" (A French Sunday newspaper) at the end of September, Strauss-Kahn is France's favourite left-wing person to represent the Socialist Party at the next presidential election. 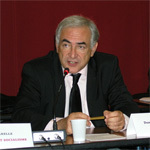 DSK was chosen it would appear by 34% of the people surveyed, over the Paris' Mayor Bertrand Delanoë (26%), Ségolène Royal (19%), and Lille's Mayor Martine Aubry (12%). Revenge is a dish best eaten cold... But to taste it DSK will have to take care of his image and his credibility. And in this aim, he will have to do his best as Managing director of the IMF. Unfortunently, directing this financial institution is a tuff job given the present economical and financial climate. The American sub-prime crisis spread all over the world. Stock markets are falling, banks are collapsing... And as governments step in to pick up the pieces after the market excesses of the past decade, questions are being asked as to whether the national and international monetary authorities could have acted earlier to prevent the present financial crisis. And guess who is first in the firing line... The IMF and his directors are blamed because they have failed to see how quickly the American sub-prime crisis could spread around the world. It's the same story in every financial crisis. At the time of the asian crisis of 1988 or the Latin America debt crisis in the early 80's, the governments called for more surveillance by the IMF. However, when the financial institution issues warnings, few people seem to take them into account. 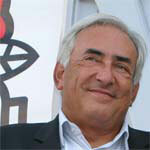 Indeed, DSK expressed his worries about the probable spreading of the crisis all around as early as last February. But the governments, were not really inclined to listen to this type of bad news and refused to hear him. 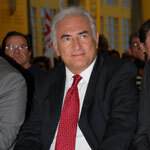 However, DSK is conscious that the IMF needs to improve its surveillance and its control over the markets. He recently repeated his willingness to transform the 54 years old institution into a kind of international regulatory agency in an effort to create and enforce global finance standards. "We can have national or regional authorities, such as the European Union for example, but we need a global guarantor", the economist said. That will not be easy, since market's regulation is quite out of fashion among the governments nowadays. Liberalism seems to sound better for our politicians. But the current crisis proved perhaps to be the limit of market freedom... And if DSK managed to transform the IMF, and to help the international financial system to become more responsible, he would go back to France with a very high credibility, He would be one left-wing politician, who proved he was able to carry out important reforms, and who has an important international experience... In short, he would be positioned as being the socialist candidate with the most credibility for the 2012 Presidential Election. Good question after this week end !! !